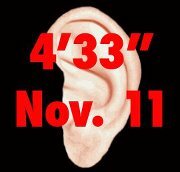 Perform John Cage’s 4’33” on November 11th, at noon local time, anywhere in the world. Perform alone or gather in groups. Locations, photos and recordings of the event can be posted on the Cage’s 4’33” Facebook page. 2012 was the centenary of the birth of renowned composer John Cage. Around the world, music organizations, ensembles, publications, and schools planned significant events to celebrate Cage and his impact on the art world. Composer and multi-instrumentalist Randy Raine Reusch, in dicussion with composer-performer Tina Pearson, proposed a free, open and global event centred around Cage’s iconic 1952 composition 4’33″. The invitation read as follows: “At noon local time, wherever you are on November 11, 2012, gather at a park near you or anywhere you wish to be with a musical instrument and perform John Cage’s 4’33″. The event has turned into an annual one, with open participation: Everyone is welcome to participate, by performing on your own, creating an event with others, or attending a known event. Visit the Facebook page to find out more or post your performance. An aspect of this score could be said to encourage listening without judgement. Listen to the world around you, listen to your heart, listen to all the sounds you have heard, listen to all that you have ever heard, will hear, have not heard, listen to everything at once without identifying it, labeling it or judging it as good or bad.